Quite honestly, on the list of things I’m supposed to keep in mind as a parent, I never knew such a question existed. Until now. Ron Chenoweth is the band and orchestra division manager for Ken Stanton Music, a Georgia-based music education company with nearly 100 teachers providing more than 1,000 lessons every week. Part of Chenoweth’s job includes managing a team that regularly goes into schools to help band directors determine what instrument each student should play. Two things he and his colleagues are always looking at are body type and personality. If a child likes to be the star of the show, Chenoweth might steer the child to the flute because flutists tend to stand in front of the band. Other instruments for extroverts, Chenoweth says, are the saxophone and trumpet. 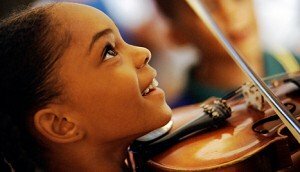 Physical characteristics can determine the best instrument for a child too. Take the bassoon, for example, which isn’t ideal for small kids. “The bassoon, when assembled, is almost 6 feet tall, and the spread of the finger holes is ridiculous,” he said. Someone with very small lips might be better suited for the trumpet or French horn, while someone with larger lips might have trouble playing those instruments, according to Chenoweth. “The cup size of a trumpet or a French horn would be too small, and they wouldn’t actually be able to produce a good sound,” said Chenoweth, who played the French horn in his high school and college marching bands and has been involved in music education ever since. Oboe: An important trait for mastering this “very intricate” instrument is “above average intelligence,” according to Chenoweth. Tuba: An excellent choice for students with larger lips, he said. Trombone: The player’s front teeth should be even. “You want a nice bite that shouldn’t be in need of orthodontia,” he said. Violin: Kids can start playing as early as 2 to 3 years old. “I think because they have varying sizes, it makes them rather universal,” said Chenoweth, who started playing the clarinet in the fourth grade. Even before you start assessing whether an instrument matches your child’s personality, or if they have the right body type for success, you should let your child be the guide, Chenoweth says. “My first thing is you have to get them onto an instrument that they first are interested in because if there’s little interest in playing it, there will be the same amount of success — very little,” he added. Try not to push them to play what you played, said Chenoweth. “Private lessons at home with the parent are not necessarily going to be successful,” he said with a laugh. And always try to be supportive, even when it just might not be music to your ears. Dr. Nina Kraus, professor of communication sciences, neurobiology, and physiology, and the director of the Auditory Neuroscience Laboratory at Northwestern University, has been studying the impact of music training on a child’s cognitive development for almost a decade. Her extensive research has been published in more than 200 journals and media publications. Defining a musician as someone who plays music twice a week for 20 minutes, she and her team compare how the brains of musicians and non-musicians respond to sound and the impact music playing has on the musician’s attention, language, memory and reading abilities. If my girls weren’t already signed up for music lessons this fall (we’re starting with piano! ), I’d be signing them up today. Previous Previous post: What’s the Right Age to Begin Music Lessons?